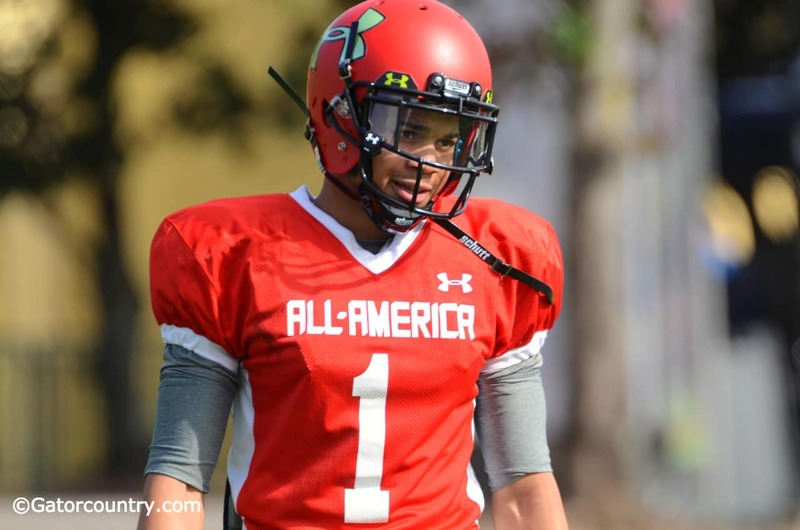 Jalen Tabor was one of 11 players Will Muschamp flipped from other schools to Florida in the recruiting class of 2014. PD’s Postulations: A signing class for the ages? Well that remains to be seen, but there are several artifacts that lead me to believe there is a good chance that the University of Florida class of 2014 will be looked back upon as a watershed class. Before we get to the reasons, I’d like to address some recruiting topics that came up and were heatedly debated as signing day drew near. Thus according to Alec Baldwin’s character in “Glengarry Glen Ross.” And in the month of February, many Gator fans have been snapping at Will Muschamp to “Put That Coffee Down!” Keeping with the going meme that he cannot close. That’s a very general statement, but in this context it is used in a very narrow sense: signing prospects who are either uncommitted or committed to other schools on National Signing Day (NSD). Right off the top, let me say that I hate the concept that closing only happens on signing day or even the last weekend. It’s a penny-shallow, 1-second-attention span view of the concept. In my book, closing means closing the deal on the most important targets of a class. I don’t care if it’s the first week of February for this class or the third week of February for next year’s class. Closing the recruits on the top of the board is the game. One reason I put such low stock in closing on NSD is the nature of the prospects left on the board. The guys who wait until NSD to commit are almost always one of two animals. They are either (1) kids who are indecisive, all over the map with their leans and can’t be pinned down because they simply can’t make up their minds, or (2) kids who have known for a long time where they are going and just say what coaches want to hear so they can take all their visits and enjoy the process and the parties. I don’t find anything particularly wrong with either, but fact is there is almost nothing coaches can do to “close” on these guys on NSD. The members of the first group are coin flips and members of the second group were already closed in the fall or even the summer or spring and aren’t changing their minds, no matter what salesmanship the coach throws as them. And there is another layer to the insincerity and lack of credibility to NSD closers. Coaches that have been known as great closers because they earned the rep of grabbing a huge haul in the last 3 days have some things in common. Primarily they are doing one of two things every year. The first option is that they are locking down players in January or in the fall or even summer or spring and asking them to remain silent, take their other visits and wait until NSD to announce. That way, all the prospects which were “closed” earlier in the year look like they were closed in a brilliant, fantastic finish. These coaches are savvy of the huge positive publicity this generates with the media and they also know that the longer recruits hold out, the higher their rankings and star ratings go with the recruiting services (and the late signees always give a false boost to class rankings in the same way that a November loss on the field is weighed far more in the polls than a September loss). These coaches use the system to manipulate the ratings and rankings for their own buzz and publicity. The second option is illegal inducements. You’ll note that the all-time reputation king of closing was Bobby Bowden, and he was a career kingpin of both timing his commitment’s announcements to manipulate the rankings and of giving prospects illegal inducements to sign with FSU. I’ll stand by my assessment of Muschamp as an outstanding closer. Not because of anything he does in the 72 hours preceding NSD, but because of the recruits that he has closed irrespective of the calendar. He closed Will Grier – the best quarterback in the nation – despite having an offense the last four years that behaved as if the forward pass were a foreign language and they had no translation dictionary. He closed on six big time offensive linemen, despite having one of the most inept offensive lines in the nation over the last four seasons. He closed on some of the elite talents at their positions across the country for a team that only won four games last year, and despite all their most historically fertile and geographically favorable recruiting grounds being a rare barren landscape this year. So I don’t think the criticisms that Champ can’t close were valid even before NSD this year. However, this year even satisfied the narrowest definition of the concept of closing: Champ closed the deal in the 11th hour. First he closed huge offensive lineman Drew Sarvary on the national juco signing day. Then Champ flipped elite prospects and early enrollees Jalen Tabor and Brandon Powell four and three days, respectively, before spring semester classes began. Then came the big haul. After hearing on Monday that both Lorenzo Carter and Damien Prince had decided to go elsewhere, and after FSU later extended Derrick Kelly the full scholarship offer he was waiting on, the Gators entered the eve of NSD with four prospects on the board, two of them committed to other programs. Then there was J.C. Jackson, who had been perceived by almost everyone to be wavering on his commitment for weeks and rumored heavily over the preceding week to be headed to either Miami or FSU. But Champ went 4-for-5 signing these prospects, with Vanderbilt commit Andrew Mike starting it off by flipping to Florida just before midnight. The next morning, J.C. Jackson was the second letter of intent to roll of the fax machine, and both FSU commit Treon Harris and recent FSU defection C.J. Worton pulled the trigger for the Gators within minutes of each other later in the morning. Only Adoree’ Jackson eluded Florida on NSD, choosing to stay near family on the other side of the nation rather than to make a serious run at the Olympic team by joining the Florida track team, the premier track & field program in the country and the premier program in the long jump – his main event – and to train under the likely Olympic team coach, Mouse Holloway (and, of course, play a little football along the way). For all the gloom and doom around Gator Nation the week prior, I’d say it surprised a lot of people that Champ went 4-for-5 on NSD targets still considering us. Batting .800 on NSD is rarefied air, I don’t care who got away. If Coach Muschamp needs some coffee, we should all be willing to pour him a cup after that close. Despite going 4-for-5 on NSD, there were a lot of grumblings over failing to sign Adoree’ Jackson, and for not getting the signatures of Prince and Carter, despite never really having a fair shot and doing Yeoman’s work just to get so close to grabbing both. Phrases like “there is no excuse,” and “struck out” were tossed around liberally. Though the staff did their absolute best – and possibly the best that could be done by anyone – some responded that their best was not good enough. To this I only ask, what would we have them do? They cannot work on closing them outside their NCAA-controlled contact hours. They cannot bar other schools from recruiting them. They can’t boss the recruits around and force them not to take calls from other schools. They can’t stop schools like Ole Miss, Clemson and FSU from lying to them and giving the kids illegal inducements. And if the staff’s best may not be good enough, what would we have them do? Cheat? Lie? Engage in legal but filthy recruiting tactics? And even if they did, that is still no guarantee. Let me tell you the story of the recruitment of LeRon Williams. He was a super-stud small forward that was named Florida’s Mr. Basketball for the 1993-1994 season. Lon Kruger was recruiting for the Gators during the Final Four season in the Andrew DeClerc/Da Meat Hook Hill era. Though he was a home-grown Florida product, though Florida had been recruiting him for three-and-a-half years, though a mere ten days had passed since the Gators competed in their first-ever Final Four, and though he had friends from his Bradenton Southeast high school like Reggie Green already at Florida and urging him to join them, he was totally up in the air as for picking a school between UF and a few big time national programs. Programs that Florida had never beaten out head-to-head for anyone. Do you know what made his final decision for him? Random chance and the biological necessity of a cold-blooded reptilian metabolism. On the eve of his big decision, the night before the spring signing period began, he was driving home on an atypical chilly April night. It was the kind of night when reptiles often lay their cold-blooded carcasses in the road to borrow some of the elevated temperature the heat-attracting blacktop had captured during the day. Well, one of those reptiles was a small alligator. And LeRon just happened to come upon it around a turn and ran it over. In his rear view mirror he saw the gator scamper off full-speed into the scrub. He said that he took that as a sign that he should sign with Florida and become a Gator: the animal that got run over by a car but was still unfazed. Now what if Dean Smith had done the perfect recruiting job and made the perfect close … and lost him because he happened to randomly run over a crocodilian with his car? An awful lot of these decisions come down to something equally random and equally uncontrollable by the pursuing coaches. When this happens, how can you hang it on the coaches for not doing enough? Adoree’ Jackson picked USC over Florida because of proximity to his new home and soon-to-be transplanted family. Should Champ have pushed the North American tectonic plates closer together? When it appeared as if Isaiah McKenzie would pick Virginia Tech because it was his childhood dream school, should Champ have rented Dr. Brown’s Delorean time machine and Flux Capacitor himself back to McKenzie’s childhood and do a Vulcan mind meld and change his favorite player to Rex Grossman instead of Michael Vick and favorite team from VPI to UF? Sometimes there is just nothing a coach or staff can do to get the commitment or signature of a 17-year-old kid. And sometimes that works to Florida’s favor. But sometimes not. As promised, here are five reasons this year’s signing class may turn out to be one for the ages. 1. The Bonnie Situation: When a certain player flipped from FSU to the good guys on NSD, my mind was immediately turned to that chapter in Pulp Fiction that wrapped up the movie, much like this signee wrapped up the Florida signing class of 2014. Consider Treon Harris the “Bonnie Situation.” As the weeks went by after Treon’s highly successful official visit to Gainesville, and word continued to circulate about the building relationship between the Florida staff and the Harris family, his flip seemed more and more inevitable. And Samuel L. Jackson’s line from the movie kept reverberating in my mind: “You’ve got to appreciate what an explosive element this Bonnie situation is.” And I mean that not only because of what an explosive play maker Harris is, but also from the perspective of all of Florida’s rivals – particularly the two big in-state nemeses who mine south Florida for a significant portion of their talent base every year: Miami and Florida State. The flip of Treon Harris was a tectonic shift in the state of football in Florida. Not only was Treon the crowning jewel on a chest of south Florida treasure the staff brought in this year, but he hails from Booker T Washington, one of the elite programs in the nation, fresh off a mythical national high school championship. His father Tim “Ice” Harris is one of the best and certainly most influential high school coaches in the state, if not the nation. His good word of mouth about the Gators could unlock a lot of doors in south Florida. And then there is Treon himself. He is the kind of player and personality that will likely be a pied piper of sorts for elite players in south Florida and beyond. The explosive elements of the Bonnie Situation could start to impact Florida football as soon as this fall, perhaps even sooner as the staff strengthens its relationships with south Florida targets looking to follow Treon to Gainesville. 2. The Flipper Effect: Last year Muschamp flipped seven players who were committed elsewhere to become Gators. He flipped so many that folks took to calling him “Flipper.” But it was just one year. It was fun while it lasted. Nobody can expect that sort of thing to continue year to year. Until the class of 2014, when Champ flipped ELEVEN players who were committed to other schools. On average, that’s one short of double-digits flipped per year over the last two years. This is a critical skill in today’s age of high school kids holding such a different definition of “commitment” than the rest of the world. The most successful coaches on the recruiting trail will now be the ones who can not only close on uncommitted players, but also pry away committed players and flip them into their camp. In his first three years with complete recruiting cycles, Champ has flipped commitments from FSU (5), Miami (2), Notre Dame, Ohio State, Penn State (2), Clemson, Auburn, South Carolina, Louisville, Mississippi (2), Vanderbilt, Arizona, Texas Tech and South Florida. Eight taken from state schools and five taken from SEC schools. This signing class unequivocally established Muschamp as “The Flipper.” For rival coaching staffs, no commitment is safe; for Florida fans, no committed player is out of reach. 3. Transformational Player: The last several years we have seen what just one transformational player can do to a team, especially if that player is a quarterback. Last year, Jameis Winston certainly proved that point for FSU. Before that there was Cam Newton. And Tim Tebow. And Vince Young. And Reggie Bush. Before them were guys like Charles Woodson and Danny Wuerffel and Charlie Ward. All of them elevated their team to another level – some of them elevated them many levels. All of them led their teams to national titles. Almost all of them were quarterbacks. 4. Another Level: The classes of 2012 and 2013 were very strong classes and may have been on signing day better classes on paper than 2014. They may pan out to be better classes overall, as well. But if the Gators are going to return to the elite level of college football in the near future, it will be the class of 2014 that provides the most fuel. The class has, as mentioned, the quarterback of the future. In fact it has the quarterbacks – plural – of the future in Grier and Harris, a tandem who are both happily headed into a dual quarterback cooperation, not competition in Kurt Roper’s new offensive scheme. But it is also the first class recruited to fit the new offensive scheme – a scheme that is the missing piece that can take Florida back to the top of the SEC and the nation. 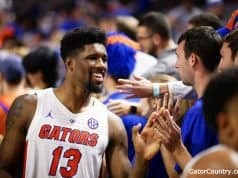 On Florida’s current timetable for returning to glory, this class will be hitting its stride when Florida enters the ring as not just conference and national title contenders, but teams to beat. That is, of course if they get there. If they do, it will be largely the class of 2014 that takes them over the top. 5. Will-Crusher Will: What must Florida rivals think? Florida only notched four wins in 2013, and this stellar head-turning class is as bad as it gets? What must Florida State fans think? Florida had its worst season in over 30 years, and FSU just won the national title…and Florida not only stole four of their commitments (and would have had a huge fifth flip, had they been able to keep it a secret a bit longer) – while they only stole two from the Gators – and Florida signed a recruiting class that is on par and may be even better than theirs. What else can FSU do? How much further can things go right for them and wrong for Florida at the same time? 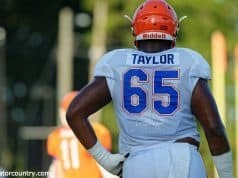 FSU was supposed to be raiding Florida’s class of commitments dry of their only skill player talent and the Gator class was going to disintegrate; a 4-win season and all the innuendo about Muschamp’s shaky job security was supposed to keep the elite prospects away in droves; three years of terrible offense was supposed to keep all the offensive talent steering clear of the Gators … and yet Florida’s top-5/10 signing class still came to Gainesville. And those Semis with their Semi-feet ice cold in a row, stood puzzling and puzzling: “How could it be so?” It came without wins. It came without brags. It came without packages, boxes or bags. A recruiting Christmas came to Florida. It came just the same. That has to drain their will to the absolute bottom of the well. One of the original columnists when Gator Country first premiered, David “PD” Parker has been following and writing about the Gators since the eighties. From his years of regular contributions as a member of Gator Country to his weekly columns as a partner of the popular defunct niche website Gator Gurus, PD has become known in Gator Nation for his analysis, insight and humor on all things Gator. A truer statement could not have been spoken…. Next time I see you, I will give you the biggest handshake ever. Thank you for having the guts and the morals to put this to your keyboard. So many times over the 80’s… we saw this. Something that needed to be said… because soooo many FSU fans are in complete denial on this. Because all of us know that Sir Bobbah not only walks on water… but above it too. By the way… fantastic, fantastic article. The Harris flip was monumental. Not only for our team… but for the scores of connections down in Dade and Broward. Well, I now know the meaning of delusional. It fits you. To say Bobby Bowden offered illegal inducements shows you have gone off the deep end. You’re also nuts about flipping five of FSU’s recruits. The only one that FSU wanted that UF took was Treon Harris. Both Sousa and Worton were let go because they had bigger fish caught, Lane and Rudolph. Worton got too cocky when he tweeted Rudolph and was told his services were no longer needed in Tallahassee. They thought they were getting Dupre as well, but lost him to LSU. FSU also wanted J.C. Jackson, I guess you can count him as well, but that happened before the season ever started. It’s pretty silly of you to think FSU is worried about a 4-8 team. UF did very well this year recruiting, but you are a little daffy when you seem to think they beat FSU in recruiting this year. In fact, UF did poorly in the state of Florida and I’ll tell you why. Florida had an elite group of running backs and receivers this year, and UF failed to get a single one. Heck, even Ohio State was able to swoop down and grab one of the receivers. I wonder if you’ve been around long enough to realize that it’s pretty silly to get excited about recruits,especially at UF. Just to let you know, both Brantley and Driskel were all-world prospects. One was a bust and the other has been a flop so far. If you were not delusional. you’d know that UF would trade the players you say they flipped from FSU for Cook and Lane in a heartbeat. Especially Cook, he may have made the difference in helping Muschamp to keep his job. I remind you that if UF doesn’t improve in wins and losses, Roper will be gone along with Muschamp. You’re kind of cocky to be bragging about a 4-8 team that has a coach on the hottest seat in America. Isn’t spin a marvelous tool?? I have read Parker’s articles for years now… and this one above has to be one of his all time best AND most accurate at that. Damn…he literally NAILS it. And I am not too sure how old you are…. but I have been reading sports articles since the 60’s… and comparatively speaking… Parker’s article is a slam dunk. But isn’t spin a marvelous tool?? Wow, if you must spread such nonsense, at least use paragraphs. FSU isn’t worried about a 4-8 team? When is FSU ever not worried about UF– worried about the fact that UF was down for three seasons instead of the being down for 14 years in an easy conference like FSU– worried about the fact that UF hit rock bottom at the exact same time FSU reached the top of the world and that it hasn’t phased UF’s recruiting even slightly– worried that UF has a more acclaimed and experienced coaching staff– worried that UF can sell out their larger stadium even during mediocre seasons while FSU can only barely manage that when they are in the top 5– worried that UF football is wildly profitable while FSU football needs to tap Florida taxpayers to cover their coach’s salary– worried about all the cheating they had to do to make their comeback and the future sanctions and decades of utter mediocrity that will follow. I suppose FSU has nothing to worry about. I’m sure they are much more concerned with the really tough competition they have to face in the ACC. lol. I’m beginning to think that insanity is contagious from reading the comments that agree with the writer who is suffering from FSU envy. 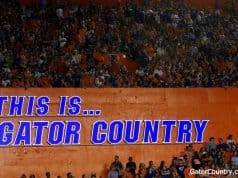 UF should not be jealous of FSU and start making statements that aren’t based on reality. Now someone says that UF ‘s coaches are better than FSU’s? The record says differently, Fisher is 3-1 against UF and just won a national title. Muschamp’s name didn’t get mentioned for the Texas job, and he had been the coach in waiting. Fisher could have taken the job if he wanted it, it would have been much better for UF if he did. I’m trying to be the sane one here. UF did very well recruiting this year and may have a better class than FSU’s, who knows? We won’t know for another two, three, or four years. But it’s pretty silly to think FSU’s worried about UF. FSU did do a better job than UF in getting the players they wanted. It’s nothing to brag about flipping recruits from other schools when the reason for going after them is that you failed to get your top choices. Porter, Powell, Mike, Harkless, Worton, and Sousa all fit that description. Then to brag about Sarvary is stupid as well. No one wanted him and the Gators took him because they were desperate after Silberman transferred. To top it off, you impugn the reputation of Bowden, that makes you really seem stupid. I don’t know what is is about some Gator fans that they seem to go off the deep end at times. It’s one of the reasons that Spurrier left UF because of crazy folks like these. I just don’t know why some people can’t be happy with something that’s good, like the great class just signed, instead of riding off into a world that doesn’t exist except in their minds. First, I’m changing snow print to SNOW BLIND. Second, Sir Bobby impugned himself by staying past his sell date. He and he alone dug a hole so deep you almost couldn’t climb out of it. Your trustees had to pry his fingers off the door knob to his office in order to save your program. He got your team on the map and took it off the map. Go ahead, find an inaccuracy in this story.